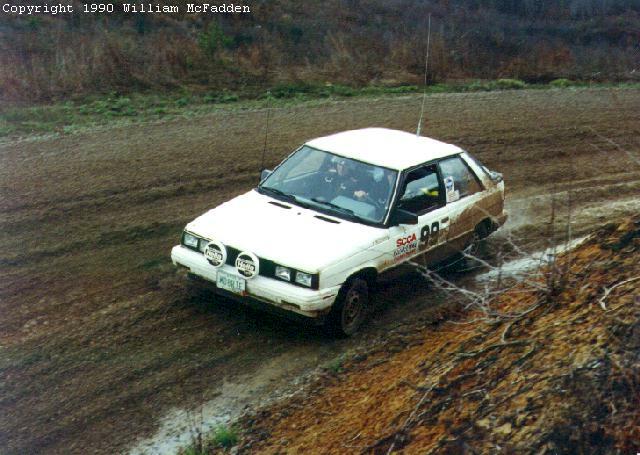 In a former life--before I moved away from central Ohio, went to the Persian Gulf during Desert Shield/Storm, came back to southeastern Ohio, got married, bought a house, had a child, had another child--I enjoyed the expensive hobby of road rallying. 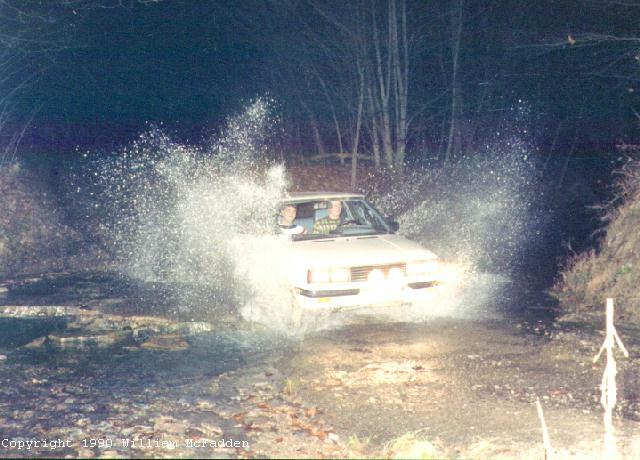 A water-crossing on an Ohio Rally Championship event in 1986. 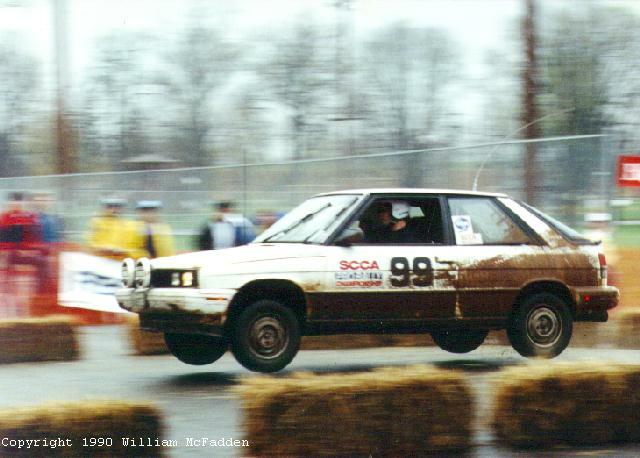 I was introduced to road rallying about 1984 with the Ohio State University Sports Car Club (OSUSCC) winter rally series. This series featured monthly Time-Speed-Distance (TSD) rallies on paved public roads at legal and safe speeds. My navigator for these events and for all subsequent events was my good friend John Engle--who has also left rallying following his marriage, house purchase, and the arrival of children. 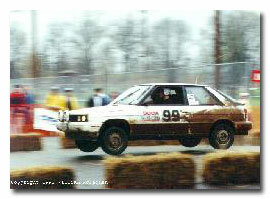 During my association with the OSUSCC events I drove a 1976 Volkswagen Rabbit and a 1979 Subaru Brat. John and I also competed in SCCA and Central Ohio Rally Club Saturday-night events. The OSUSCC provided stage crews for the Tulip 200 Divisional Pro Rally, where I was a corner-marshal and was introduced to as-fast-as-you-can-drive-at-night-on-closed-gravel-roads rallying, and I liked what I saw. I went on to be stage-captain at several Sunriser 400 National Pro Rallies, with other OSUSCC club members working the stages. John and I liked rallying enough that we started competing in Ohio Rally Championship (ORC) series European-style brisk TSD events in my Encore. These events were 100 to 200 miles in length, were typically run at night on gravel roads, and called for brisk-yet-legal speeds. We were most successful competing in Class B (rally odometer allowed but no integrating computers). Some of the events we competed in were Harvest Moon (Dayton, OH), Night Moves (Newark, OH), and Thunder Ridge (Chillicothe, OH). Eventually, John and I put on our own event, the Land Of Legend, in and around Coshocton, Ohio, for several years. modified spare-tire well to accomodate and secure two spare wheels/tires. All of the Renault Cup equipment was purchased second-hand. With the addition of the roll cage and other safety equipment the rally car and my amateur radio license opened the door to participation in the Sunriser 400 National Pro Rally as the Course Closing Vehicle, and later as Course Fast Open Vehicle. Both required that the course be driven at or near competition speed, so John and I experienced the rally without having to spend the very large (more than $400!) entry fee, and we didn't have to hold SCCA competition licenses.